Jona Rosenfeld, AM '56, PhD. '62. 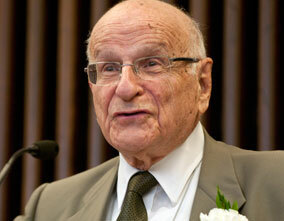 is widely regarded as an architect of research-informed and tested mental health services for the State of Israel. The first full professor at the Paul Baerwald School of Social Work at Hebrew University, Jerusalem, Professor Rosenfeld was the first recipient of the Israel Prize for research in social work in 1998, on the 50th anniversary of the establishment of the State of Israel. The Israel Prize is the highest national prize awarded to experts of their field. Professor Rosenfeld is recognized for myriad contributions toward building social work institutions through research and social work education in Israel, as well as internationally. A founder of the National Council of Schools of Social Work in Israel, the Association of Social Workers, and National Council of the Child in Israel, Professor Rosenfeld is credited with developing a continuous learning process adopted by quality assurance and educational institutions in Israel such as the Ministry of Social Welfare, Ministry of Labor, and the Ministry of Education. A pioneer from the very beginning of his career, Professor Rosenfeld was the first mental health officer in the Israeli Army. He started his career as a child and family social worker at the Lasker Mental Health and Child Guidance Center of Hadassah Medical Organization in Jerusalem. He also worked with Youth Aliya and the Child Guidance Clinic. Much of his work was with Holocaust survivors. He is the author of over 100 publications and studies, including five books. His research and work have had a direct impact on international thinking about how to engage poor populations and to include them as contributors and collaborators to institutions and society. Professor Rosenfeld undertook the first study on poverty – at the time (in the 60s) an undefined field of service in Israel. His work was sponsored by the United States International Office and the United States Department of Health, Education, and Welfare. This work was presented to a conference for the United Nations in Europe – which led him to collaborations with the International Movement ATD Fourth World. This nongovernmental organization is engaged in serving families in extreme poverty and who experience marginalization.